One of Cessna’s most advanced and desirable planes, the Citation Sovereign+ is ideal for corporate flights and also offers total comfort for leisure travel because it has features that perfectly meet the needs of an increasingly competitive, global, and connected market. The aircraft features Pratt & Whitney Canada PW306D engines, standard autothrottle and enhanced performance with the addition of winglets, which increase its reach to 3,200 NM (5,926 km), allowing for economical cruising and direct ascent to 47,000 feet. The Citation Sovereign+ comes with a wireless media server, integrated cabin phone, and satellite Internet. In addition, it was the first of the Citation line to incorporate Garmin G5000 avionics, simply the most advanced in the category. Well thought out details leave your travels even more pleasurable. That's why the Citation Sovereign+ has a superior finish, new climate control and entertainment systems, always with maximum comfort. 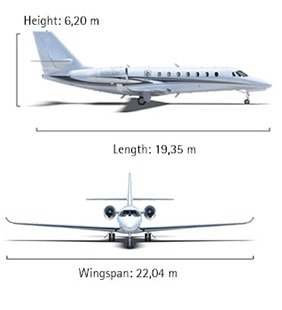 Modern and bold, the model’s design brings together aerodynamic features characteristic of the Citation line. The Citation Sovereign+ features a large and spacious cabin that can be configured in a variety of ways. *Ask us about other configuration possibilities for up to 12 passengers.